The animal shelter summer party is today, and young Tony wants to contribute his panther to the raffle. Tony is well aware the dogs and cats at the shelter require a large amount of money for their food and medical care. Once done, Tony looks at the drawing and decides his panther—a handsome fellow—will not bring in the money the shelter needs. Tony packs up his stuffed animals. Mom is not sure this is a good idea. “But you love them so much!” Tony insists the stuffed animals want to help the shelter. The shelter director is thrilled with Tony’s contribution. She decides his panther needs a place of honor and takes Tony to the cat room. There, she introduces Tony to Valentine, a big, shy tomcat. Tony gently strokes Valentine’s head and hums the song, Little Night Cat, the tune Mom will play at the event. During the afternoon, Valentine and Tony bond. When found, Tony looks Paul over and says, “Poor kitty!” Paul, more than 30 years old, is missing his eyes. Tony suggests using mom’s shiny orange earrings. With a black circle in the middle, each earring is a perfect cat eye. Tony snuggles Paul and soon falls asleep. Arriving home from school the next day, Tony finds Paul safe and happy in a basket below one of the stools. Sitting on the stool is a big, shy tomcat Valentine. Little Night Cat emphasizes the importance of animal shelters and their need of funding. Whether it is a raffle to raise money or some other event, it is important to support these homes of last resort for abandoned, abused, and stray cats and dogs. Adopting Valentine is the second key to the welfare of the shelter and a grand reward for Tony’s own aid to his local shelter. Children are capable of understanding another’s need. As Little Night Cat shows through Tony, kids can make life-changing contributions. Kids will empathize with Tony’s selflessness and the consequences of his actions. His mother’s quick response to her son’s anxiety helps Tony just as he helps the shelter animals. Children will understand Tony’s inability to sleep without his animals. Danowski’s watercolor and gouache illustrations are magnificent. These paintings look every bit majestic and important. The two wordless full spreads highlight Tony with Valentine, first at the shelter and then at home. The illustrations are crammed with details, making the images of home look real. Kids will enjoy looking at and finding different details. Parents can make a game out of this, by asking their child to find Tony’s picture of Valentine, the night moon, variously numbered stuffed animals at the raffle, or any of what must be hundreds of details. Little Night Cat effectively shows the need for aid at animal shelters, many of which run on donations. It reveals how, in most any situation, children can help. Though the story is mostly told, it is difficult to dislike Little Night Cat for lack of more showing. Danowski’s beautiful illustrations are perhaps the best part of Little Night Cat. 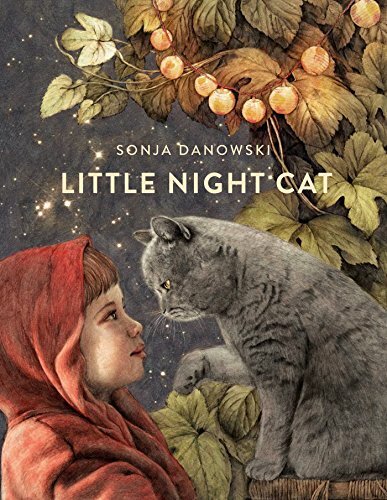 At the back, Danowski leaves readers with the sheet music for her composition, Little Night Cat, which Tony hummed to shy Valentine. Sonja Danowski is a German gem. More of her work needs translated for children to enjoy. Sue Morris is a former children's social worker, a member of the Society of Children's Book Writers and Illustrators, the National Book Critics Circle, and a 2016 Cybils Judge. At Kid Lit Reviews, Sue is the author of nearly 1,000 children’s book reviews.